From 1957 to 1962, pop and rockabilly star Rick Nelson recorded a string of number 1 hits such as Be Bop Baby, Believe What You Say, Poor Little Fool, Lonesome Town, It’s Late, Stood Up, Hello Mary Lou, and Travelin’ Man. Although these hits were produced before multitracking and digital recording, their sound quality is incredible—powerful and punchy, wide range, with extremely low hiss. What a sound they got 50 years ago. 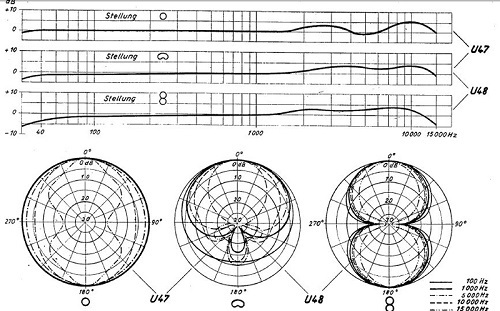 By studying the recording techniques used back then, we may get some clues about improving our recordings today. Let’s fill in some background. Rick recorded his first albums at Master Recorders on 535 Fairfax Avenue in West Hollywood, California from 1957-1961. Abe “Bunny” Robyn engineered, and arranger/A&R man Jimmie Haskell produced. Both of their contributions to the sound were huge. Rick’s label at the time was Imperial Records started by Lew Chudd, who had been recording rockabilly and R&B. The label set up Robyn with his own studio as the only engineer. With Imperial, Robyn had done sessions for Fats Domino, Little Richard, and Leiber/Stoller. One fateful day, Lew asked Jimmie Haskell to take Ricky Nelson into the studio and make some hit records. Around that time Ricky was a teenage star in the Ozzie and Harriet TV show. A fan of country music, Rick said that he always tried to emulate the Sun Records sound of artists such as Carl Perkins, Johnny Cash and Elvis Presley. Rick had tremendous love for the music. As a singer he had impeccable pitch and timing, and a very wide vocal range. The classic band who backed up Rick included famed guitarist James Burton, drummer Richie Frost and upright bassist James Kirkland (later replaced by Joe Osborn). Background singers were the Jordanaires, the wonderful Nashville-based gospel quartet who also backed up Elvis Presley. Studio piano players included Gene Garf, Ray Johnson and Leon Russell. Rick Nelson (with guitar) and the Jordanaires (source http://www.rickynelson.co.uk). The masters are 15 IPS, full track mono or half-track stereo, Scotch 111 1/4-inch tape with acetate backing, on large reels with center hubs. Listening to Nelson’s recordings, I can almost smell the tape and feel the tubes heat up. “Since high fidelity recording includes a true reproduction of all sounds without discrimination or distortion, the original recording was done on an Ampex 300-C Magnetic Tape Recorder at 15 IPS using Scotch tape. “To effectively record the full frequency spectrum Telefunken U 47M microphones were used. Tape to disc transfer employed an automatic Scully lathe with heated stylus using a Grampion feedback cutter system. A large part of the sound was due to the legendary Telefunken (Neumann) U 47M microphones used on the sessions. “Since its original development in 1946, the ubiquitous TELEFUNKEN U 47 has been the microphone of choice for generations of recording professionals. The first condenser microphone to offer selectable polar patterns, the U 47 is instantly recognizable (Figure 2). From Frank Sinatra to the Beatles, the sonic performance of the U 47 is legendary as a vocal microphone. The U 47M used an M7 mic capsule, BV8 output transformer and VF14 vacuum tube. The mic is famous for its clear sound due to a rise in the upper-midrange of its frequency response. When set to a cardioid pattern, its response is basically flat from 40 Hz to 15 kHz with a 4 dB shelf from 3 kHz to 12 kHz (Figure 3). The 7 kHz region is less boosted, which reduces sibilance. This frequency response makes the U 47 especially suitable for capturing the sound of rock ‘n’ roll. Let’s explain. Remember the Fletcher-Munson equal-loudness contours? The ear is less sensitive to lows and highs (around 4 kHz) at low SPLs than at high SPLs. So when you record a loud rock band (say, at 110 dB SPL) and play it back at a normal listening level (say, 85 dB SPL), the sound is weak in the bass and highs—unless you compensate with EQ or with the mic’s frequency response. Since the U 47 boosts the lows with proximity effect, and boosts the treble with its presence rise, its recordings simulate the fullness and edge of a loud rock band even at low volumes. As for mic techniques, all the instruments in Nelson’s records were individually miked. One U 47 over the drum kit picked up the entire set (based on other musicians’ session photos of that era). 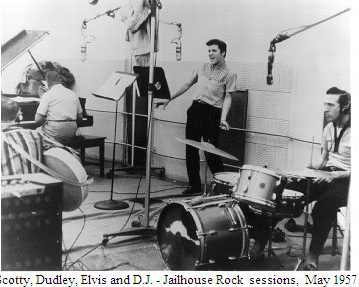 For example, Figure 4, below, shows the drum miking at an Elvis Presley session. Master Recorders had isolation booths shaped like little cabins with windows. As the band played in the studio, Rick sang in a booth while listening over headphones. Sessions were recorded on either 1, 2, or 3-track recorders, usually with several generations. 1. Instrument tracks were recorded with Rick doing a guide vocal as a reference. Most of the instrument mics were mixed live to mono or stereo. 2. Rick overdubbed the lead vocal. 3. Rick overdubbed acoustic rhythm guitar and occasionally some other vocal parts. At least two guitars were used on all the recordings. Figure 4: Mic techniques at one of Elvis’ sessions. Source: scottymoore.net. 4. The Jordanaires overdubbed their backround vocals later when they were in town. Sometimes they would add their harmonies to an unfinished track that had no lead vocal. They worked out the arrangements with Rick in the control room. 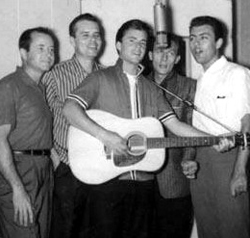 After a few years, singers Burgess, Fuller and Campbell replaced the Jordanaires, who were busy with Nashville sessions (Figure 5). After BF&C added their vocals, Rick would come in the next day to say what he liked and didn’t like, and the singers re-did their parts as needed. 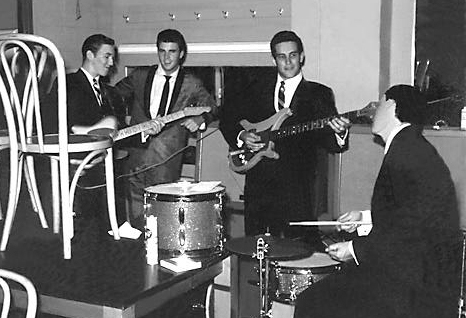 Figure 5: Rick Nelson and the band. Engineer Robyn sometimes would take the first part of one take and the second part of another take, and splice them together. A typical session of two complete recordings lasted 3 hours. As for effects, it’s easy to hear the tape slapback echo in the 45 single version of Be Bop Baby. The album version of the same song was mixed with plate reverb instead, and in my opinion the slap echo was much more effective for that song. Most of Rick’s songs used a lot of plate reverb. James Burton got his unique twangy tone by using fingerpicks and a flat pick on his 1953 Telecaster guitar. He replaced the first four strings with banjo strings, then replaced the A string with a D, and replaced the low E string with an A. As James says, “I already had my sound. The tone of my guitar is the sound we went for and what I like and what we basicially did on all the records”. In Rick’s early recordings, they used an acoustic bass rather than an electric. The result is a pulsing, buoyant bass sound that an electric bass can’t provide. To make the music sound fuller when heard on the lo-fi TVs of the 1950s, Haskell learned to roll off the deep lows below 100 Hz to remove the “soggy” sound, and to add more bottom above 100 Hz for punch on the bass and kick drum. To keep the highs crisp after up to seven generations (bounces), the engineer would boost at 5 kHz, 7 kHz and even 20 kHz, knowing that some highs would be lost on each generation. Haskell sometimes told the engineer to add 3 kHz to make Rick’s vocal and James’ guitar a little harder or brighter. Occasionally Rick would suggest that they add 3K to the mix. A good example of this EQ technique is Rick’s 45 single recording of Believe What You Say, a power-packed rocker. 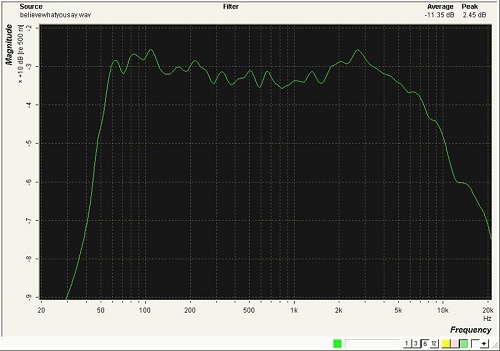 Figure 6 shows the long-term averaged, 1/6-octave spectrum of the song as measured by Harmonic Balancer. Unlike many recordings whose spectrum rolls off above 1 kHz, this mix is strong out to 4 kHz, which creates a very aggressive sound. You can also see a low-cut below 50 Hz and a boost at 100 Hz. Want to hear some of these terrific recordings? I highly recommend the 6-CD boxed set Ricky Nelson - The American Dream. Mastered from the original tapes, it includes a large book with loads of photos, history and session notes—truly a labor of love. Figure 6: 1/6-octave spectrum of Believe What You Say. It’s a fascinating compilation. In many cuts you can hear studio talk, alternate guitar solos, false starts, versions without Rick’s vocal, and instrument tracks without vocals. Re-issue producer: Bob Jones, Mastering: Bob Jones with Mike Brown, 3-track mix: Bill Inglot. Using equipment and techniques that are simple by today’s standards, many recording engineers of the 1950’s were able to create fabulous sounding records. We can learn a lot from them. •	Interview with Jimmie Haskell at http://home.att.net/~kwm2/rickynelson/interview.html. •	Email from recording engineer Marty Elliott, 8-27-02. Write about Techniques Used To Record Rick Nelson! Do you have content or pictures, to add, on the Techniques Used To Record Rick Nelson? Please feel free to Share it, here! What other Visitors have said about - Techniques Used To Record Rick Nelson!